In our turbulent and intensifying political moment, many might assume that brand construction should veer toward the apolitical, toward the most neutral territory of political representation possible. At first glance, this would make sense; it is obviously not in a company’s best interest to explicitly alienate any demographic on the basis of political ideology. Brands hold substantial credibility in the American consumer psyche, and the ability for individuals to connect to brands of course directly corresponds to sales. In the publishing world, this isn’t any different, and new titles are typically marketed in such a way that allows for maximum appeal across demographics. Looking outside of the publishing industry, however, we see a different story unfolding and a new marketing technique trending. 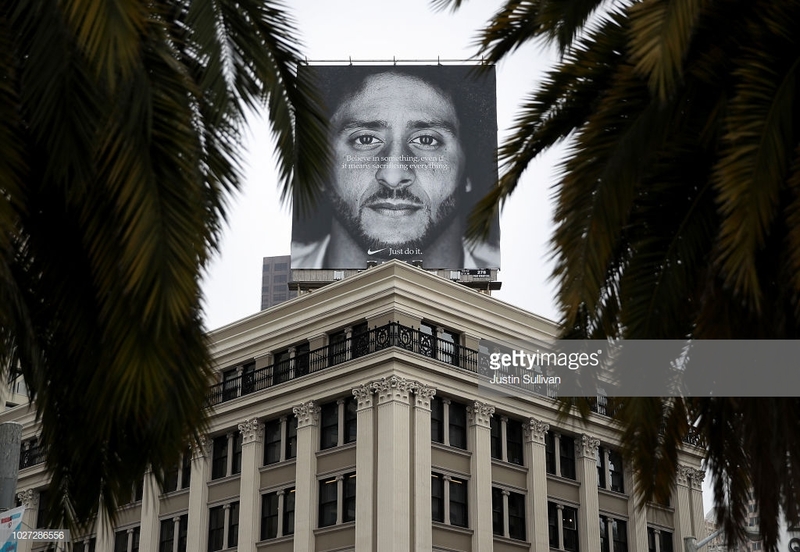 One of the most visible brands in the world, Nike, shook the world when they presented the face of the thirtieth anniversary of their “Just Do It” campaign to be none other than former NFL player Colin Kaepernick. Kaepernick, former player for the San Francisco 49ers, was heavily scrutinized and threatened for his protesting of the playing of the national anthem before games, during which he would take a knee rather than stand. Despite the fact that this protest was rooted in combating police violence against African Americans, the act of kneeling was seen by many as a symbolic attack against American veterans. At first glance, it wouldn’t seem to be in Nike’s best interest to support Kaepernick directly, let alone make him the face of the company throughout its most notable marketing campaign. As it has turned out, Nike’s support of Kaepernick has paid off. Make no mistake of it: Nike’s move to support Kaepernick was a calculated move toward further brand success, and it is exemplary of how a brand can simultaneously be on the front lines of a social justice movement and increase profitability. Nike recognizes that people do not simply look at brands for products and services, but as something that both influences and reflects their values. In true democratic fashion, The New York Times shows that two-thirds of Nike’s core audience is under the age of thirty-five and is substantially more racially diverse than previous generations, indicating that these social groups are very likely to respond positively to Nike’s support of Kaepernick. Nike also knows that this demographic and political correspondence isn’t going to change. While 78 percent of people expect brands to stand up for social justice issues, 84 percent of millennials expect brands to do so as well, and this is only going to keep trending this way. Nike’s campaign has resulted in high profitability despite an initial stock dip, and perhaps more importantly, Nike’s social media brand visibility has skyrocketed. For the publishing industry, brand social responsibility is a very real thing, despite the fact that much of branding is not consumer facing. Being socially responsible means that we must look to the future, and we must anticipate not only what our customers are concerned with now, but also the relationship our brands will have with our customers in emerging social climates. Much like Nike gaining appeal and publicity through social media shares and searches, the publishing industry must look to social media and digital marketing tools in order to both analyze the social justice trends of today and forecast the trends of tomorrow. While it is important to respect our consumer base of the past, the consumer base of the future will no doubt be born out of the marriage between brands and social activism. This marriage is inevitable; brand consciousness and the social identities of individuals and groups are concretely intertwined in our digital sphere. Publishers—big and small—are thus left with the choice: jump out in front of this and market your brand for the progressive future, or at some point or another, lose relevance in your market.